All transactions are safe and secure with a reliable history in online purchasing behind each of our associates. Buy the Sheldon Cooper Quotes t-shirt to own Big Bang Theory clothing and merchandise. 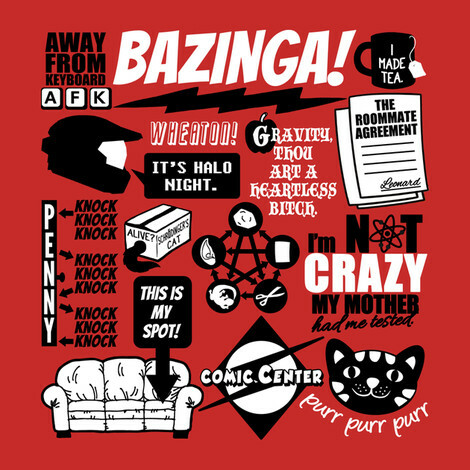 This design features the most popular Sheldon quotes, including the classic "my mother had me tested" quote. In addition to hilarious Sheldon Cooper quotes, the design also includes the Roommate Agreement signed by Leonard Hofstadter and a diagram of how to play Rock, Paper, Scissors, Lizard, Spock. Pair one of these funny Sheldon shirts with a Bazinga tee or a Robot Evolution t-shirt to celebrate the TV show's most interesting character. In addition to the Sheldon Cooper Quotes tee above, browse the Big Bang Theory Clothing Gallery for more apparel like men's and women's clothes, kids shirts or hoodies.